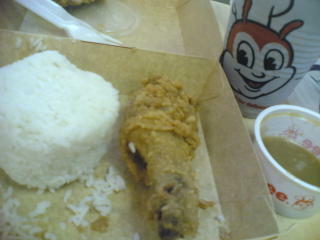 And a while ago, I had two pieces Chickenjoy with rice, extra rice, and iced tea from no other than food chain Jollibee! Well, aside from mentioning this store in a previous post, it's the nearest one to our office where I can get my chicken fix. But I prefer the spicy chicken of KFC. Top that with their yummy gravy and you get a tummy-filling lunch! What's the secret of their gravy anyways? It's just too good to pass up on! Second on my list is McDonald's. Although I seem to be sensing a difference in taste to their chicken these days than the one I got hooked on. And third on my list is Jollibee's Chickenjoy. I don't know ... I just prefer McDonald's chicken over Jollibee's. But it's good though that both serves unlimited gravy already. But I'm not too picky. Whichever store is nearest at the moment I get my chicken craving gets my order. So which chicken meal do you prefer? McDonald's, Jollibee, or KFC? 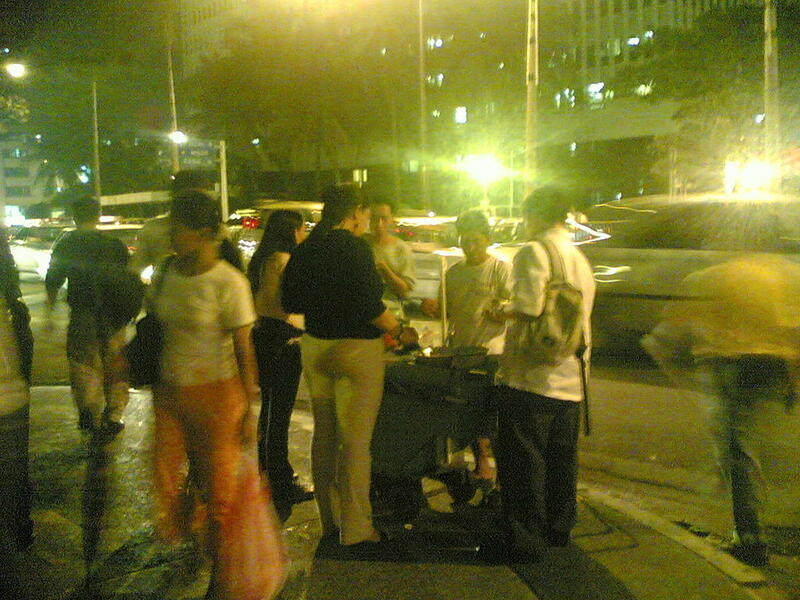 Street food ... something that the young and old alike share in the Philippines. 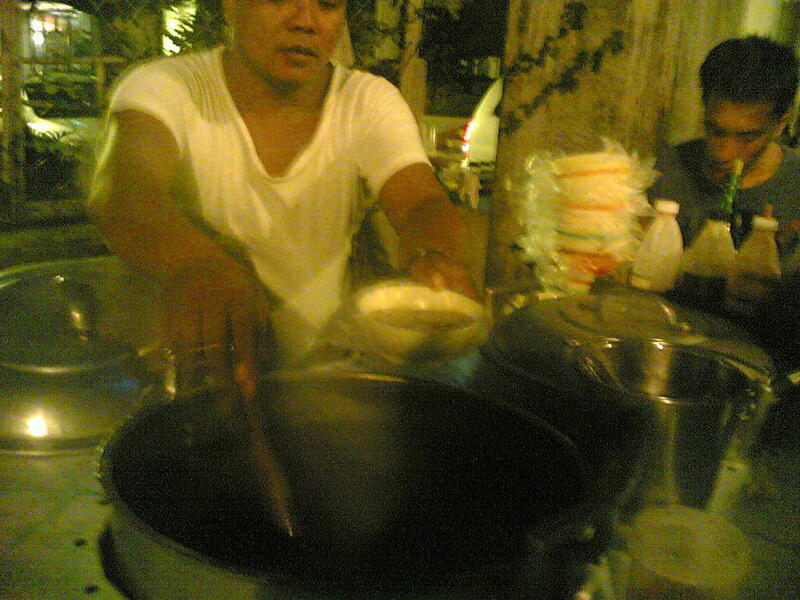 In Baguio where I grew up, we loved having Snow Cream, a crushed ice concoction with milk and pineapple juice. Perfect cooler after running around in Burnham Park in the breezy afternoon! When at home, we would hear the shrill echo of "tahooooo!" in the neighborhood streets. We would run off to the kitchen, get our bowls and tall glasses, and line up for the Taho vendor to scoop up our share of the soybean curd, sweeten it up with arnibal (sugar syrup), and mix in sago (gelatinous balls) for good measure. And off to the front stairs we seat to enjoy our taho! And then there's the puto and kutsinta (rice cakes) vendor and his horn, his two cylindrical metal containers with domed covers tied at each end of a pliant bamboo pole, and balanced over one shoulder. And who wouldn't love halo-halo on a hot summer afternoon? Yep, even in Baguio, halo-halo is widely appreciated. I miss the Snow Cream most especially. 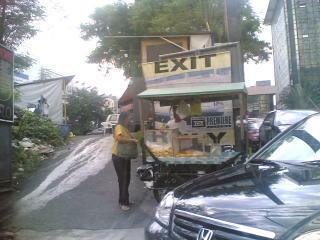 Their carts used to be abundant in Burnham Park, but I have seen no trace of them in years. They have been replaced by the stationary binatog vendors, with their vats of steamed corn and shredded coconut wafting lazily through the air. 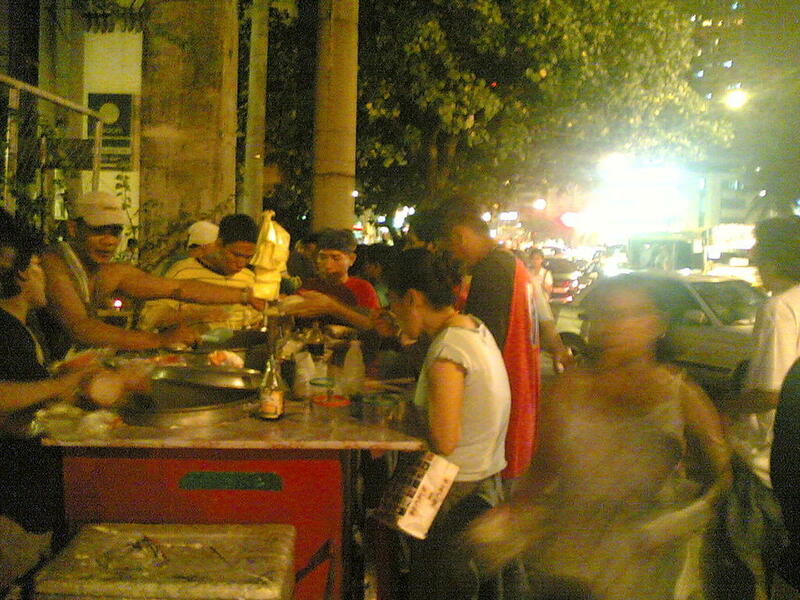 Here in Manila, I got a taste of street fare the city has to offer. Most recently is this thing called Pares (pronounced as is). I can count with one hand the number of times I have eaten in a pares stall, particularly because ... well, I do not like eating out alone. Only when somebody invites me to eat in a pares stall do i get to do so. I have mentioned such a story in a previous post but did not come accompanied with photos. Here are some I took a couple of nights back. Nearby is a squidball vendor. Strange, after eating two orders of rice at the Pares store, one of my colleagues headed off to the squidballs and munched some more. Can't get enough of street food, eh? And then there are the "processed" fruit vendors, with pineapples conveniently sliced for you (add a dash of salt and you're ready for a mouth-watering treat!). They also have skewered mangoes dipped in vinegar, and sliced seasonal fruits such as watermelons. 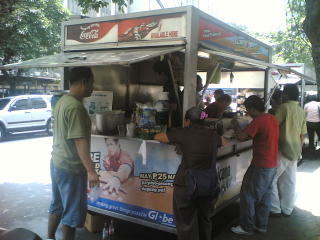 While Pares and the fruit stall produce is not part of my regular diet, Jollijeep offerings has definitely become one. Jollijeep is a fun Filipino term for those roadside stalls that offer breakfast, lunch, dinner, and merienda in-between. These stalls were originally modified jeepneys, with their wide window openings retrofitted with ledges to display the meals available for the day. Some have already been sized up in cellophane for take-out, while dine-in customers can have their order served on plates. You have to eat standing, though. These jeepneys would position themselves on a strategic parking slot in Makati and pay for the entire day's parking fee. Business caught on, and soon these mobile food vendors sprouted everywhere. The local government caught on and offered stationary stalls with a fixed monthly rent instead. But the name Jollijeep (derived from the fastfood store Jollibee stuck. Street food on a "professional" level! These stalls have even produced specialties. Like, the best place to get your laing fix is in Aguirre Street. 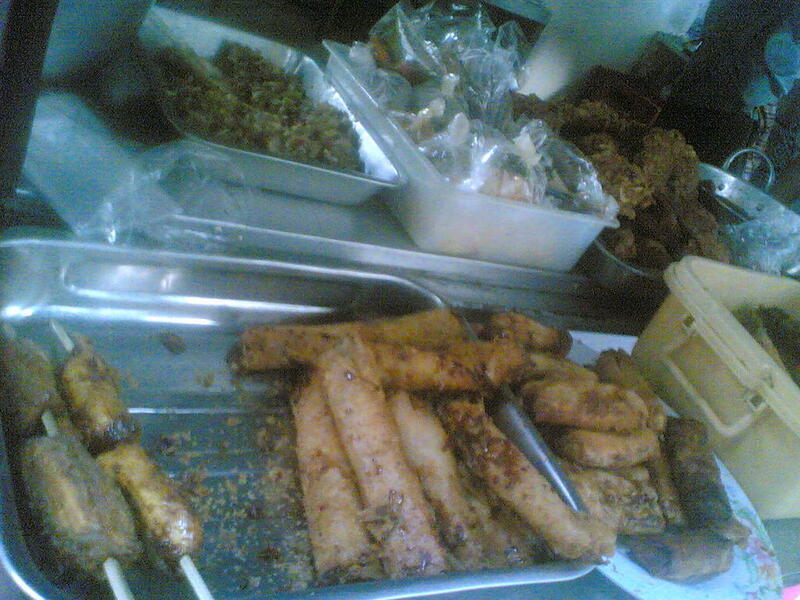 And if you like lumpiang shanghai, you can get it near Salcedo Place. But if you're in a hurry, simply head off to the nearest Jollijeep store for a truly fastfood fare. Ito ang madalas ko marinig kapag nalalaman ng kausap ko na galing ako ng Baguio. Parang mas marami pa ang populasyon ng mumu kesa sa mga buhay! :-) Well, lately medyo natatabunan na ang mumu ngayon ng ukay-ukay shopping galore pero kapag nag-o-organize ako ng Baguio outing ng mga kabarkada ko at i-book ko sila sa Teacher’s Camp, may mga natatakot pa rin. Exciting, di ba? - take long walks with his friends from home to The Botanical Gardens and back? - catch tadpoles, put them in jars, and watch the black bodies swim against the afternoon sunlight? - obssess with papier mache' and make molds out of anything in the kitchen? - make kites and fly it in Burnham Park? - play with paper boats in rainy afternoons? - be interested with origami? - plant trees, flowers and vegetables? - make handmade greeting cards? - do makeshift tents using blankets and the living room sofa? - get stranded in a raging river with friends on a rainy weekend afternoon? - collect stamps, coins and rocks? - like rainy days just the same as the sunny ones? - write to Santa Claus and ask for Lego? - be entertained with weekend cartoons? - get interested in reading? - take up his blog when he's capable of writing? Jo-Lo is now a member of the Christian World! In case you were wondering. Jo-Lo's full name is Jose Carlos Orioste Ballesteros. His name was derived from a combination of his lolos' (grandfathers') names. It was an overcast Saturday (October 8) when Jo-Lo had his christening at the same church where my wife and I exchanged wedding vows. Good friends and family from Baguio, Manila, and La Union were present to witness this momentous occasion. Bloggers Dessagirl, Chu, Pauline, Sarah and Jo-Lo's 6-month old cousin JayJay were also there. We also invited a couple of other blogger friends but did not make it due to unavoidable circumstances. It would have been great to have a mini blogger's EB in Baguio! More photos can be found in Jo-Lo's Blog. Speaking of EB, I was walking down Session Road last Sunday with friend-now-also-kumpare Harry when I saw a familiar face in front of Don Henrico's. It was BongK! He was with a friend, and they had just arrived from Sagada. I have never been there myself, but I'm looking forward to planning a trip there. They say Sagada is a wonderful place, especially in November when migratory birds from Austrialia visit there for respite from the winter. Anyways, I was also able to meet my wife's colleagues and Nora as well, who I knew way back in my Library Assistant days in college. My best friends since high school Leo, Sonny Martin, and Elmer; Tina's friends from Quezon and Manila and her colleagues were also there. Tina's good friends: [L-R] sitting down are Lea, Pnet, then standing are Upang and Marlon with son Lee. [L-R] Eric, Sir Renan, and Donald. My office colleagues and good friends. After the reception, Leo treated us to coffee to a wonderful place right in Session Road. The name of the place is Vocas, and is located at the topmost floor of La Asotea Building. You wouldn't believe such a place exists in Session Road! After climbing four floors' worth of stairs, the regular-looking entrance gave way to a high-ceilinged open space with wooden structures scattered generously with chairs and tables, staircases going here and there, a stage for performances, a wooden watermill turning ever so gently, a small bridge crossing a pond where fish are illuminated underneath the water, and an art gallery! It's like you're in a place far from the bustling city. It's the perfect place to wind down. After our coffee break, Leo went back to his crafts store in nearby Porta Vaga mall while Elmer and Sonny rushed off to catch up with their students (they're college professors). I knew that I simply had to show this place to our friends as well before they leave Baguio. So after a couple of hours, I was back there with my office colleagues and Tina's friends. We were able to meet the owner who was oh so kind to have his photo taken with us and with this huge carabao sculpture who was, incidentally the mascot of popular newspaper Inquirer. The owner is no other than the artist Kidlat Tahimik. He was a very gracious host and gamely answered our questions (the place is in existence for over a year now! But they are currently finalizing the cultural programs that will beregularly shown there. He thought it amusing that visitors think that this is a coffee shop with an art gallery, when it should be the other way around). The guy at the right is Kidlat Tahimik! It was truly a delight to be there. Visit Vocas when you visit Baguio some time. In-between rains, they managed to do a little shopping. The girls would show-off their finds and boast about how they managed to haggle the price to further stretch their now-dwindling resources. Yep, they were cash-strapped after all those trips but they were happy nonetheless. Harry and I drove off for Manila yesterday evening. By 7:30PM we started our trip via Marcos Highway. We took "the road less travelled" and ended up in the North Luzon Expressway three hours later! And that's with two stop-overs. It normally takes 4.5 hours to cover this distance. We would have made it in record time but Blackie no longer wanted to cooperate at the NLE so we had to reduce speed. Wish I can brag that I did all that driving, but I'd like to thank Harry for taking over :-). To everyone who wished us well in Jo-Lo's christening, thank you! Whew! What a week. Lots of things to do here at the office. We have an event tomorrow, plus we're preparing for the company anniversary on the 28th, and there's another event on the 21st, and a lot of other office-related activities to do. But when I'm out of the office, I'm working on the last minute details for the details on Jo-Lo's baptism. His christening is this coming Saturday. 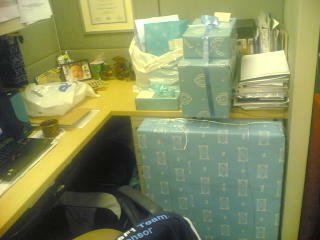 My officemates who will be coming are equally excited. Everybody (including me) assume that I will be bringing Blackie (that's the car) along, so they have been bringing in their gifts to the office and piling it into my cubicle so they no longer have to worry about bringing these in the bus. But my co-driver Harry is currently ill and is recuperating. I do hope he gets well in time for tomorrow night's drive. Friends and family from Quezon province, La Union, Manila, and Baguio City will be there to wish Jo-Lo well. I'll send news next week. Or rather Jo-Lo will. Until then! Are you usual or unusual? As I was getting my afternoon's batch of e-mails, I came across this e-mail entitled "Are you usual or unusual?" It is a forwarded message and I usually don't read such e-mails but today being Monday and all (what is it about Mondays? ), I decided to take a break. I took the really quick test and found out ... that I am usual! Aaargh. Try the test if you haven't done so yet. I was pleasantly surprised, even if I belong to the usuals. Simply follow the instructions and answer each question as quickly as you can. So, were you thinking of a Kangaroo in Denmark eating an Orange? or are you in the 2% whose minds think differently?